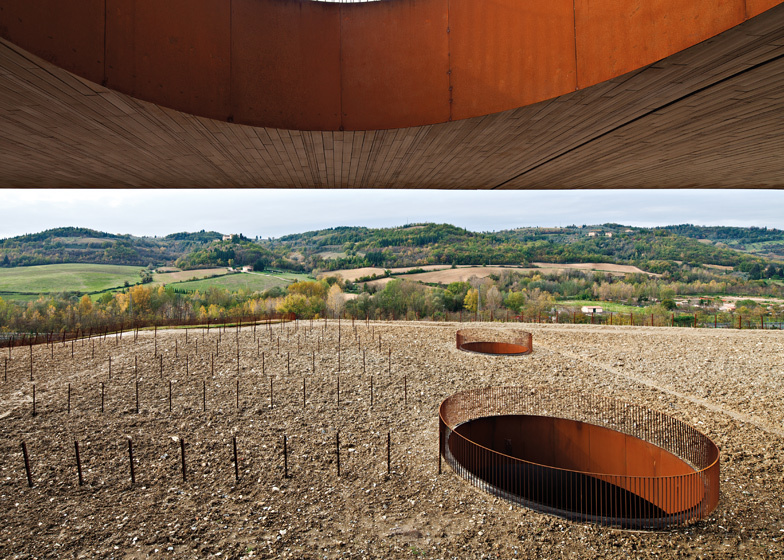 Huge terracotta wine vaults are concealed beneath a vineyard at this winery outside Florence by Italian firm Archea Associati (+ slideshow). 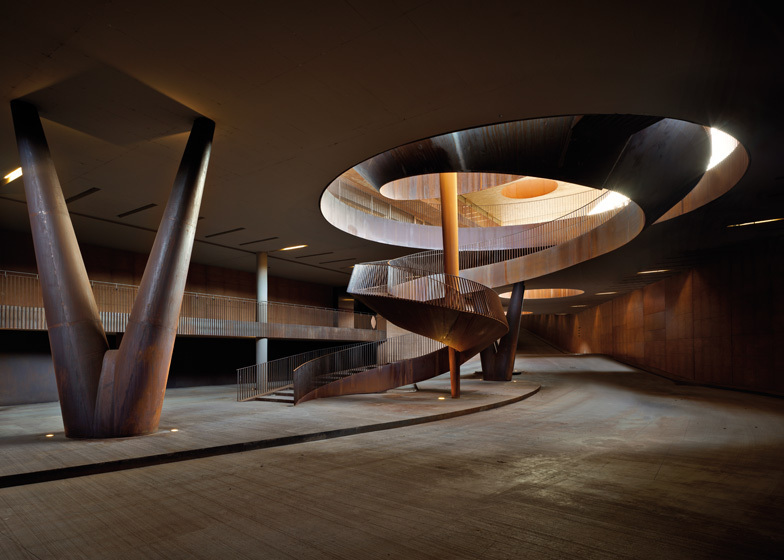 Completed at the end of 2012, the 50,000-square-metre Antinori Winery was conceived as an invisible building whose body merges with the folds of the hillside. The tiered roof is entirely covered with farmland and a pair of sliced openings infilled with glass are all that reveal the presence of the structure. 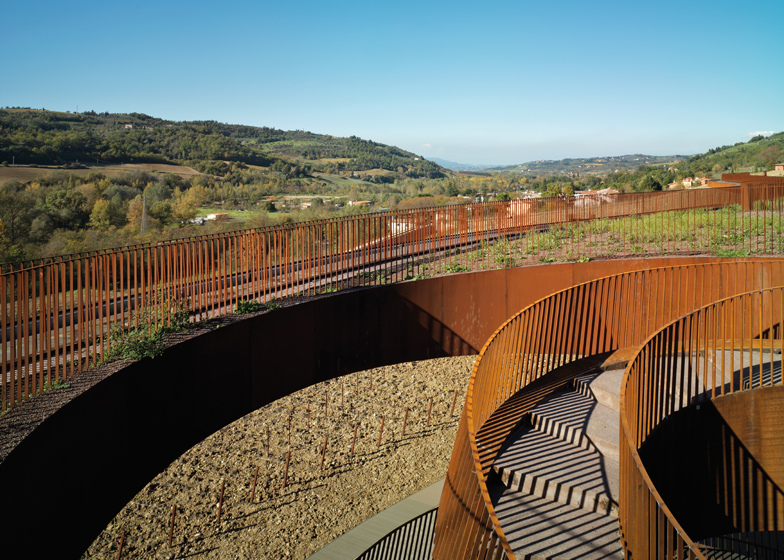 "The physical and intellectual construction of the winery pivots on the profound and deep-rooted ties with the land, a relationship which is so intense and suffered as to make the architectural image conceal itself and blend into it," says Archea Associati. The interior of the winery is divided into two main storeys. 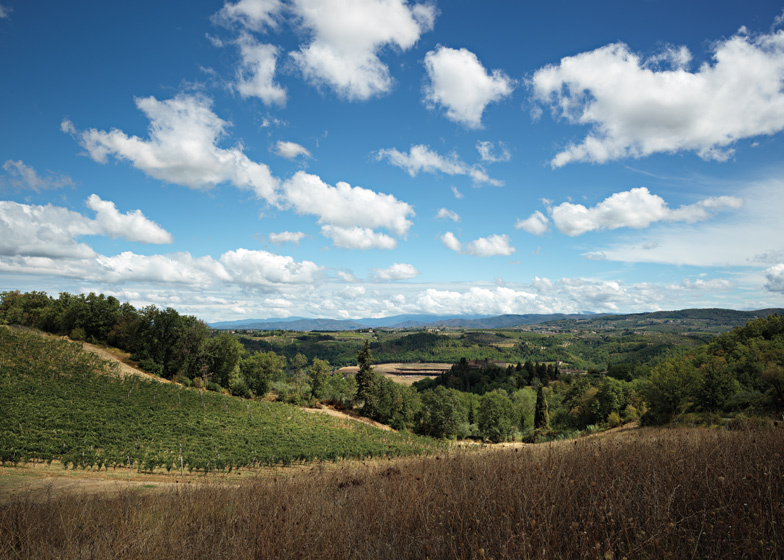 The lowest levels are dedicated to the storage and production of wine, while the upper level contains visitor facilities that include a museum, a library, an auditorium and areas for wine tasting and shopping. Circular openings pierce the roof and floors to bring light into the depths of the building. One void contains a spiralling staircase, which connects an upper-level terrace with the vaults below. These double-height cellars are arranged in three rows and are lined with terracotta on every side. 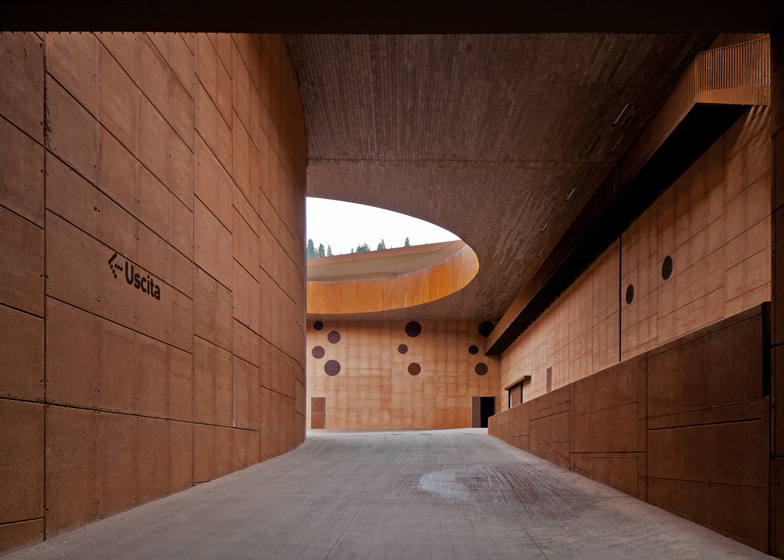 The architects describe the rooms as "the secluded heart of the winery [that] with its darkness and the rhythmic sequence of the terracotta vaults, [conveys] the sacral dimension of a space which is hidden." 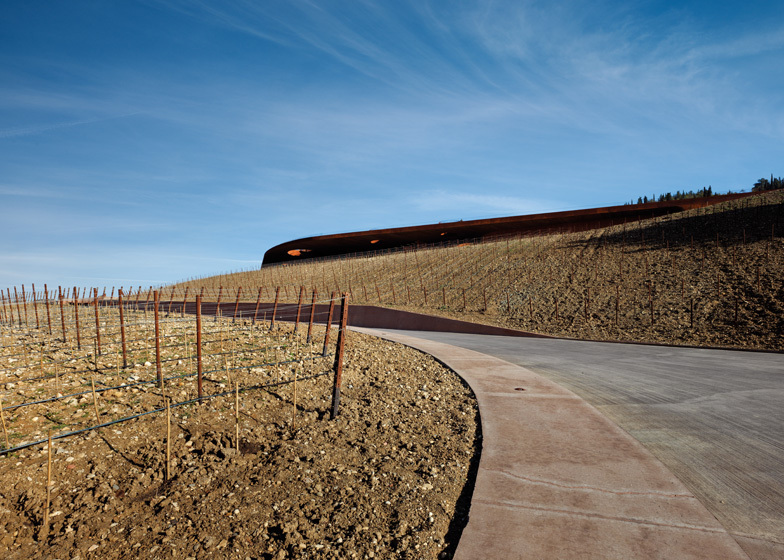 The building uses the earth as a natural insulator to maintain a constant indoor climate and keep the wine cool during the warmer summer months. 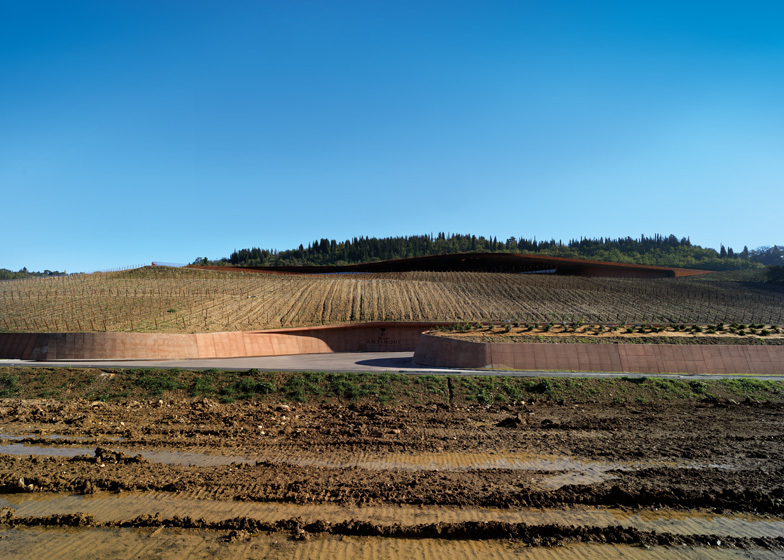 Other wineries completed in recent years include a partially submerged sandstone winery in Spain and the rusted-steel Chateau Barde-Haut in France. See more wineries on Dezeen. The functional aspects have therefore become an essential part of a design itinerary which centres on the geomorphological experimentation of a building understood as the most authentic expression of a desired symbiosis and merger between anthropic culture, the work of man, his work environment and the natural environment. 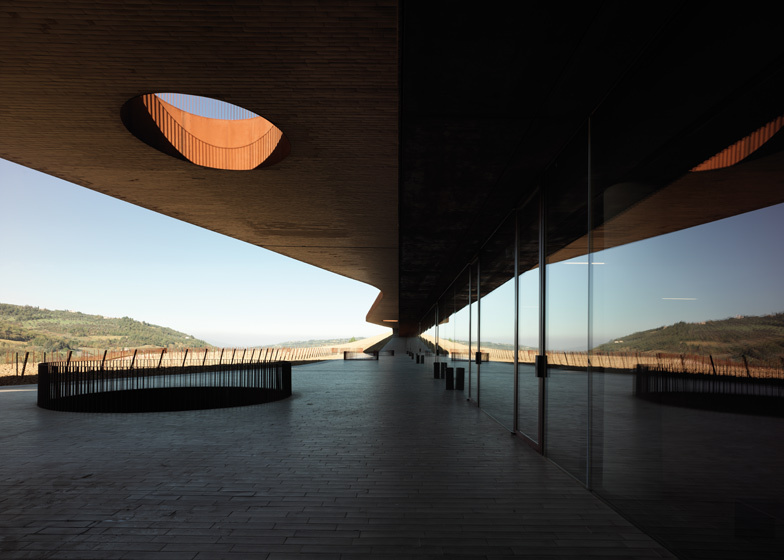 The physical and intellectual construction of the winery pivots on the profound and deep-rooted ties with the land, a relationship which is so intense and suffered (also in terms of economic investment) as to make the architectural image conceal itself and blend into it. 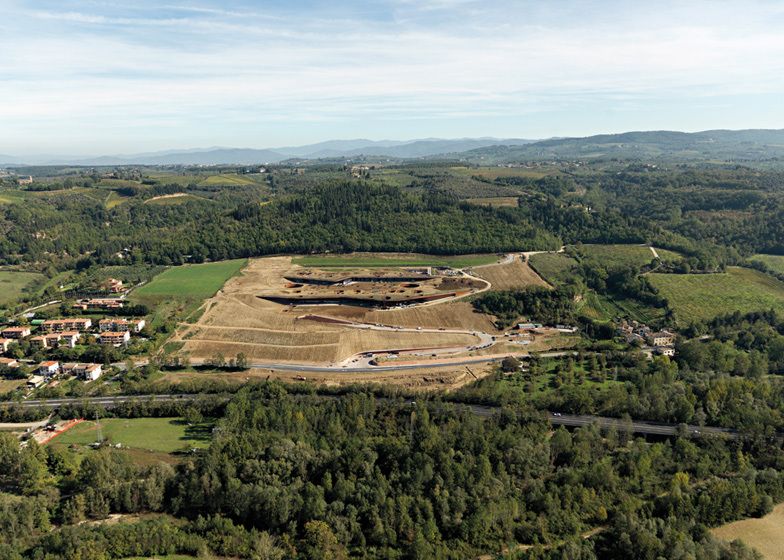 The purpose of the project has therefore been to merge the building and the rural landscape; the industrial complex appears to be a part of the latter thanks to the roof, which has been turned into a plot of farmland cultivated with vines, interrupted, along the contour lines, by two horizontal cuts which let light into the interior and provide those inside the building with a view of the landscape through the imaginary construction of a diorama. 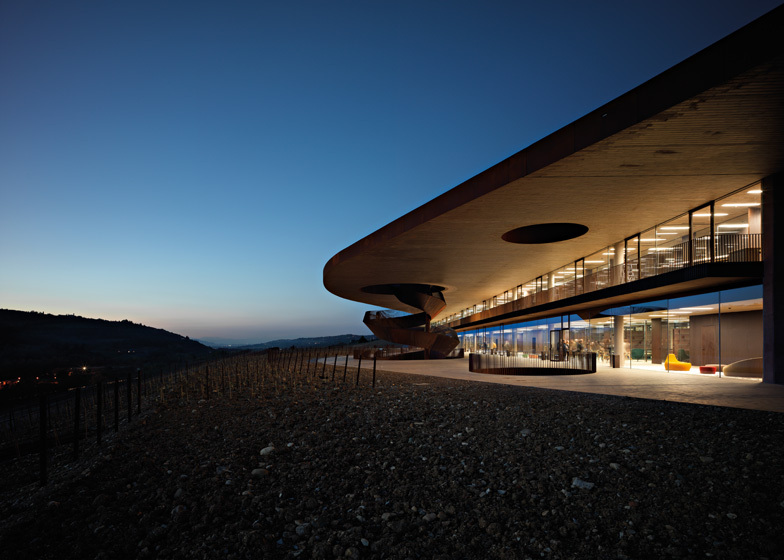 The facade, to use an expression typical of buildings, therefore extends horizontally along the natural slope, paced by the rows of vines which, along with the earth, form its "roof cover". 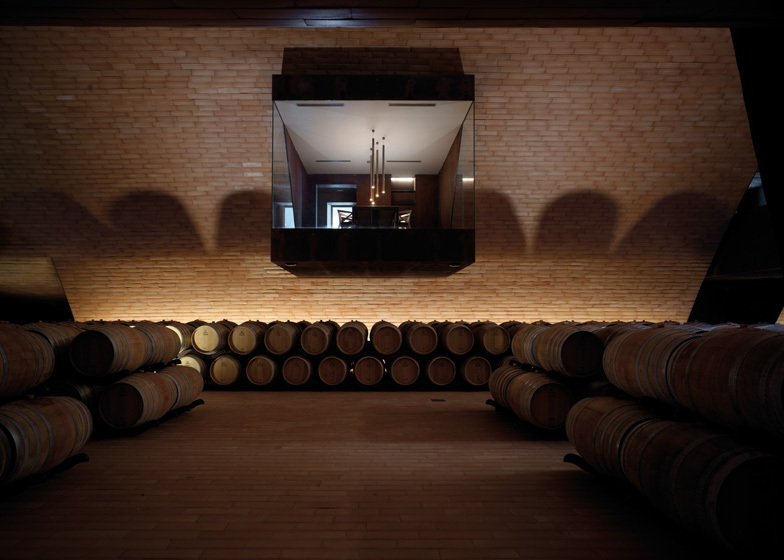 The openings or cuts discreetly reveal the underground interior: the office areas, organized like a belvedere above the barricade, and the areas where the wine is produced are arranged along the lower, and the bottling and storage areas along the upper. 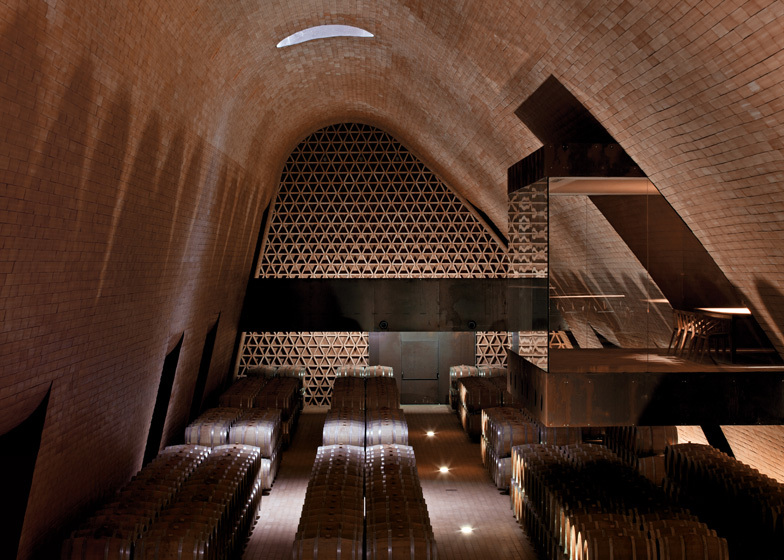 The secluded heart of the winery, where the wine matures in barrels, conveys, with its darkness and the rhythmic sequence of the terracotta vaults, the sacral dimension of a space which is hidden, not because of any desire to keep it out of sight but to guarantee the ideal thermo-hygrometric conditions for the slow maturing of the product. 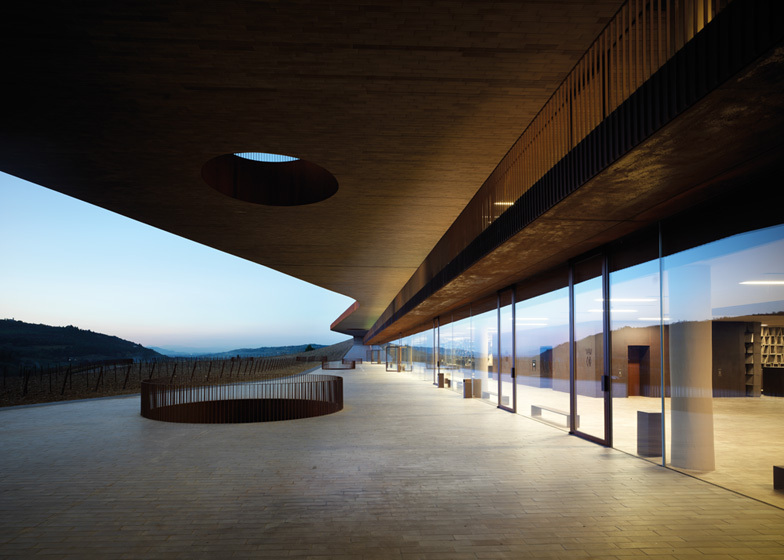 The offices, the administrative areas and executive offices, located on the upper level, are paced by a sequence of internal court illuminated by circular holes scattered across the vineyard-roof. This system also serves to provide light for the guesthouse and the caretaker's dwelling. 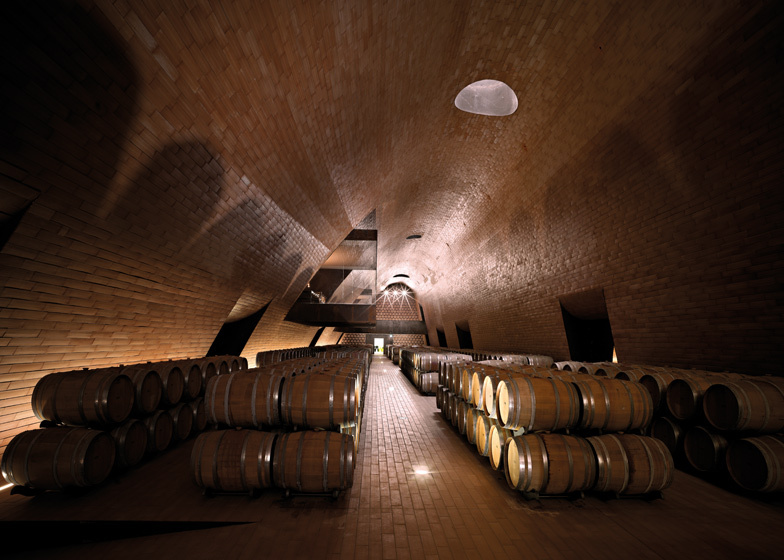 The materials and technologies evoke the local tradition with simplicity, coherently expressing the theme of studied naturalness, both in the use of terracotta and in the advisability of using the energy produced naturally by the earth to cool and insulate the winery, creating the ideal climatic conditions for the production of wine.